The Special Mothers Group, an association of mothers with children who have cerebral palsy has called on the Ministry of Gender, Children and Social Protection to come up with implementable policies for children with cerebral palsy. The group said the lack of a workable policy for children with cerebral palsy in Ghana have driven many families with such children to take the easier option of killing their children or excluding them from society. 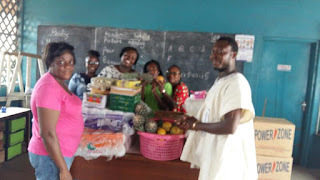 The Special Mothers made the call when they donated items including diapers, assorted detergents, stationery, fruits and vegetables valued at about GHC1000 to the children’s ward of the Accra Psychiatric Hospital. The donation was at the instance of Mr and Mrs Kwarteng, Parents of a child with severe cerebral palsy who encouraged the special mothers group to collect any amount they could afford from individual members to enable the group show kindness to the children who suffer from parental neglect and love due to their conditions. Mrs Patience Asane, a mother of a 14 year old girl with cerebral palsy who coordinated the programme, said there was the need for a proper institution where parents with such children could drop them off and pick them later in the evening to enable parents also work and earn a living. She said many parents were forced to abandon their career and jobs simply because they gave birth to a child with cerebral palsy. Mrs Asane called on government to pay attention to such children in our society since that could make a lot of difference in the lives of families with such children. Cerebral palsy is a neurological disorder that affects movement and sometimes speech of children, it is the number one cause of disability in childhood. Mr Daniel Lumor, a Special Educator at the Castle Road Special School, a special needs school located on the premises of the Accra Psychiatric Hospital expressed gratitude to the group.